You may wonder why the party did not go live last night at least on my blog. It's because it was very cold (Brrrrrrrr) outside. My thermostat is really old and it recently stopped working. Last night the temperature got below freezing. I went to my Friday small group and afterwards talked with a friend for a few hours. I ended up staying at her house where there was heat, but my computer was at home. So now with a few hour delay here is the party. You may have noticed on the blog this week, my post about Coobie Seamless Bras. I have posted about them before, because I LOVE them and they really are my most favorite bra ever. They are currently have a good sale, which you can read more about on my post. The feature this week, is Lambie's No Churn Pink Party Ice Cream by Views from the Ville. 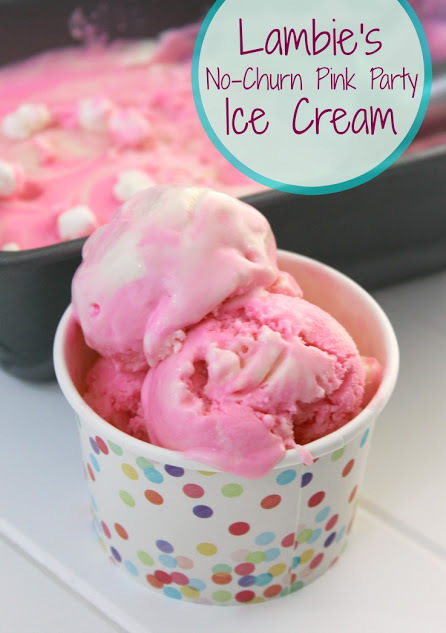 Ice cream is one of my most favorite foods ever, and the fact that it is pink with marshmallows in it all the better. It is almost time for Elf on the Shelf to return to houses everywhere. If you have on returning to your house, you might want to print this Elf Kisses Printable by my co-host Kim from Kandy Kreations. Now it is time for this week's party. You are welcome to share anything that you would like to share. If you are chosen as a feature your post will be featured on the blog and social media. This party is seen on Kandy Kreations for double exposure. Kim also chooses posts to feature on her blog and social media.